Advanced Audio Spectrum Editor. In SpectraLayers Pro 5, you can work with the individual sounds in an audio file fully visually. Transpose, extract and optimize sounds in ways never imagined thanks to the unique layers concept for the frequency spectrum. 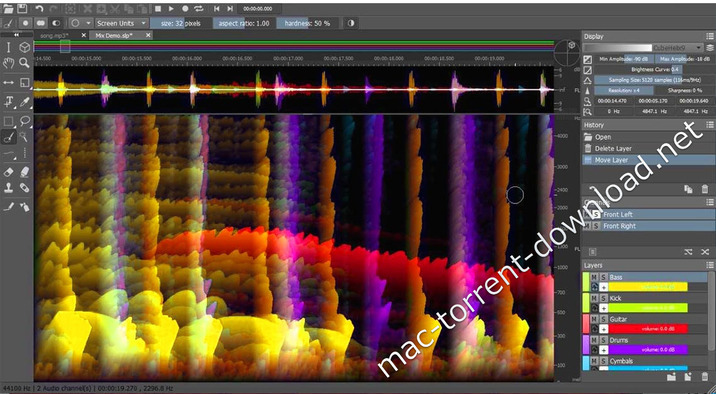 SpectraLayers Pro transforms sound into a unique visual world of multidimensional audio data. Outstanding program design, a high performance audio engine and seamless integration with other DAWs make SpectraLayers Pro one of the world’s most revolutionary spectral editing platforms. New buttons, direct editing of wave samples and volume control for groups are just some of the new program features. A preview is now available for every tool to illustrate the functionality of the tool before selection for use. Use the frequency spectrum of one layer as a cast for the overall mix. Using Spectral Casting, seamlessly integrate elements such as vocals into an existing mix by precisely “blanking” overlapping frequencies. Spectral Molding Spectral molding uses frequencies to materialize crosses between recordings for creative sound design. For example, imagine a guitar recording with an acoustic texture of vocals! SpectraLayers enables you to identify noise within a waveform in a matter of clicks and save it as a noise prints. This “print” can then be used for various types of noise reduction. In contrast to the Delete function, the “Heal Action” reconstructs types of background noise. You can now draw Spectral Markers and Spectral Ranges and save them to the project files. It’s especially useful for a forensic workflow.